Braxton Miller, Carlos Hyde and the Buckeyes are one win from the BCS title game. And what’s the only way you can survive your impending icy death in the South?. By watching football and not leaving your house all weekend. I promise, it’s the truth. Just make sure you have your bread and milk. We went 5-5 last week with the picks. 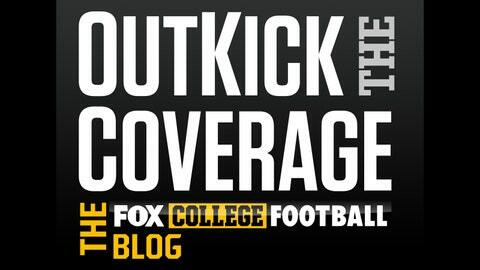 This means our yearly Outkick picks are now sitting at 46-48. There’s only one thing that can save us now. Oklahoma State is rolling better than just about any team in the nation. Since October 26th the Cowboys have won every game by at least 18 points. Meanwhile, Oklahoma has rebounded nicely since a pasting by Baylor. Unfortunately another beat down is coming for Bob Stoops and crew. Remember back when Mack Brown was finished at Texas? Well, those stories — absent the occasional flare up about Nick Saban to Texas — have pretty much died. So regardless of what happens in this ball game, what’s next at Texas? And if Saban’s not coming, then who is the actual hire at Texas if Saban’s gone? There isn’t that deep of a coaching bench right now. Baylor’s stubbed its toe of late, getting blown out at Oklahoma State and being thoroughly unimpressive for much of the game against TCU. I think Baylor regains its mojo and wins big. I’ve swung back and forth all week on this game, but ultimately I believe that Mizzou has been the most impressive team in the SEC all season. Yes, yes, I know, Auburn’s on fire, but Mizzou’s been consistent all year, their defense hasn’t allowed more than 28 points in a game and they overcame the loss of their starting quarterback. Absent a fourth quarter and overtime collapse against South Carolina, Mizzou would be 12-0 right now. I don’t think Auburn matches up well on defense with Mizzou’s playmaking wide receivers and I think Mizzou will do just enough to clip Auburn 31-28. Of course, the way Auburn has won its past two games the field may open up and swallow Dorial Green-Beckham just as he’s about to cross the goal line, Dark Knight style. It’s hard to give up points after how bad Stanford beat Arizona State early in the season, but the Sun Devils are on a roll right now and playing at home. Stanford’s been fairly unimpressive on the road this year — losses at non-top 25 Utah and USC. Yes, yes, I know that Stanford was up 29-0 at the half the last time these two teams played, but that was in September and at Stanford. Since that time Arizona State has vastly improved. I’m not sure how much better, if it all, Stanford is. In the September game, Stanford bludgeoned Arizona State, running the ball 49 times. But what happens if Stanford gets down early? Can Kevin Hogan make plays in the passing game? I don’t think so. If Stanford wins again, you can tell me I’m an idiot. Look, FSU’s going to win this game, but David Cutcliffe’s going to have Duke ready to play. Of course ready to play could mean losing by 30. But it’s a conference title game in Duke’s home state and the weather will be cold and rainy and no one will be there. Surely Duke can keep it within four touchdowns? By the way, chances that Duke actually pulls the upset. I think Ohio State wins, but the clear play here is on Michigan State, who hasn’t allowed more than 28 points all season, and is giving you nearly six points on top of what I think will be a close game. What’s more, the State offense that was so awful for so long, is finally showing signs of life. 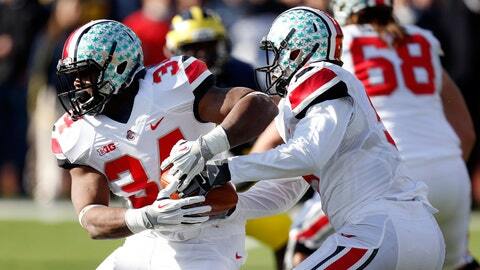 The big question here is, can Michigan State’s first ranked run defense slow down Carlos Hyde? It’s the last college football weekend of the year until the bowl games arrive in force. And there’s a ton to watch. I’ll be in Atlanta covering the SEC title game for FOX so you won’t get to see my bright and shining face early in the morning. I can’t tell you how much I’m looking forward to sleeping in on Saturday for the first time this year. (I have the Saturday morning radio show even when I don’t do television). There’s no telling how fresh I’ll be at the SEC title game. What could be a great day of college football starts early. If Oklahoma State wins, they lock up the Big 12. … then Texas at Baylor becomes the default Big 12 title game. If Oklahoma State has already locked up the Big 12 title, then the big storyline of this game becomes, does Mack Brown have to win to keep his job? The best thing about the SEC title game? Going out drinking with Charles Barkley. The second best thing about the SEC title game? Every year the SEC title game becomes a bit more like the Super Bowl. I’m curious to see how well Mizzou travels for this one. Because you know Auburn fans are going to buy up all the tickets they can find. And then some. The Pac 12 title game is a rematch featuring two very good teams. Unfortunately, it has no real ramifications on the national landscape. So most of you will watch for a few minutes during commercial breaks. FSU is nearly a thirty point favorite. That means this game could be over very quickly. If it stays tight, viewers will keep an eye on it. But just about every college football fan in America will be watching the Big Ten title game. I’ll be on the pregame show for a few minutes live from Atlanta. I can’t wait to see what happens in this one. If it’s tight all the way to the end, this will probably be the highest rated game of the year. Because you know the entire SEC will be watching as well. Plus, based on kickoff times, all of the other games will end before this one does.